Mackerel, Beet & Apple Slaw - A recipe from Savor California, the online showcase for extraordinary gourmet foods and beverages from California. Lightly toast bread and cut into triangles. In a bowl, mix together the sliced pickled beets, grated apple, lemon juice and lemon zest. 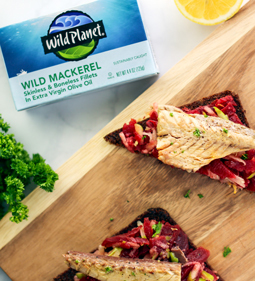 Spoon the mixture onto each triangular piece of bread and top with a piece of Wild Planet Wild Mackerel Fillets. Drizzle a bit of olive oil on top and finish with a sprinkle of chopped parsley and freshly ground pepper. Makes 1 - 2 servings.